The first open source professional ATC HMI. Albatross Display PE (Professional Edition) is the ideal Human Machine Interface for ANSPs requiring easily configurable and interoperable solutions. The Open Source development model allows a quick adaptation to evolving environments. Albatross Display PE is available for ACC, Approach, Tower, Main and Fallback systems. Albatross Display PE allows an ATCO to visualize the airspace and necessary information to support the ATCO with the safe separation of Aircrafts. It can be integrated with other ATC system components into a modular ATC system. 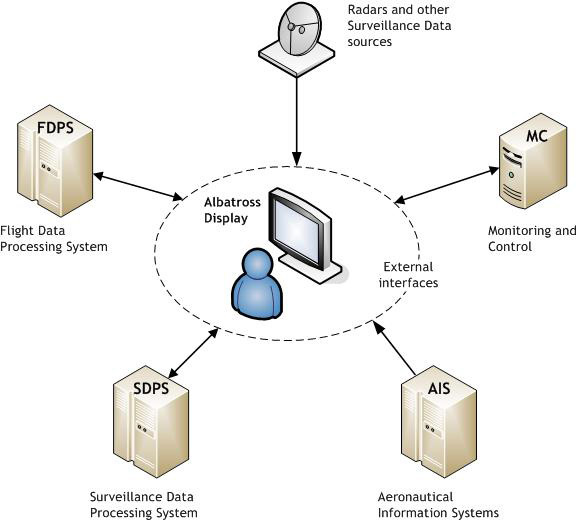 The figure below describes a typical integration of Albatross Display PE in a complete system and the interfaces between Albatross Display PE (HMI) and other ATC system components.